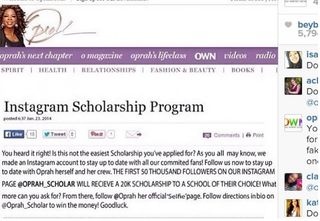 Bad news for students who thought "Oprah Scholars Program," which promised to give $20,000 to the first 50,000 people to follow an Instagram account of the same name: It's a scam. An Instagram post calling for entrants read, “Oprah Scholars Program Scholarships for the first 50K followers then partial scholarships to the first 100K followers. Must REPOST & MENTION.Goodluck!” The account is now defunct. The post went viral after generating thousands of shares and retweets in just a few hours. The grammatical errors should have served as a hint that this wasn't real, but no judgment.